1934: A camp was established. 1942: The camp was abandoned. 1929: A log cabin was built. 1930's: A camp was established. 1981: "A 50 foot high log and cable brace tower with an L-4 cabin atop was built on this point by the Selway National Forest in 1932 at a cost of $2000.00. It was taken up on the investment record in 1933. 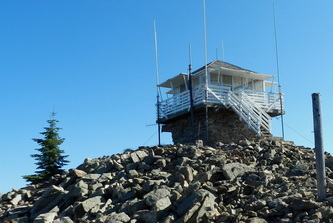 The point played an important role in detection of fires in 1934 until the lookout was forced to evacuate the cabin when the fire closed in. One leg of the tower was badly burned and had to be replaced but the remainder of the structure was not badly damaged. 1925: A tent camp was established. 1928: Improvements included a log cabin with cupola. 1970: On a 8-foot cinder block base with a new R-6 cab was constructed to replace the old log building. 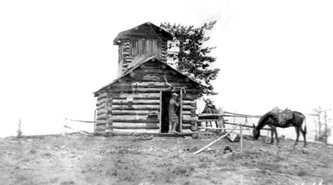 1926: A log cabin was constructed. 1930: Two platforms were placed about one mile apart. 1941: A 30-foot round native timber tower with a R-1 style L-4 cab was erected on Frisco Peak one mile to the east of the original site. 1954: The last year of staffing. 1957: The lookout structure was destroyed. 1930's ? 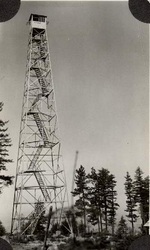 : An L-4 cab on tower was erected on the west end of the ridge and a patrol tower was erected at the northeast end of the ridge. c.1948: The lookouts were abandoned. c.1930: A camp with an alidade and telephone connection. 1920's: A crow's nest established. c.1931: A 60-foot round native pole tower with an L-6 cab constructed. Also a log living quarters cabin was built. 1958: The lookout structure was destroyed. 1981: "The point was first manned in 1933 with the lookout quartered in a tent camp. The point was manned each season thereafter until 1951. In 1934, Rufus Robinson with unknown helpers, under the direction of District Ranger Roy Lewis, built a 20' high log tower with an L-4 cabin. Construction cost was $488.00. 1937: A camp was established. 1941: The camp was abandoned. 1928: A camp was established. 1939: The camp was dismantled. 1933: 15-foot pole tower with L-4 cab. c.1930: A log cabin was built. 1940: The site was abandoned. 1981: "This point was manned only during the summer of 1939 with the lookout living in a tent camp. To get a better view of the surrounding terrain, a platform was rigged about 25 feet off the ground in a green tree with the tree top projected through it. There was no map-stand on the platform. 1981: "The point was first occupied as a full time seasonal lookout in 1914 when Middlefork District Ranger Joseph McGhee sent Wolford Renshaw and his brother Hubert, with their horses and camp outfit, from Number one R.S. to man the peak as lookout and smokechaser. In 1915 Castle Butte smokechasers Wolford Renshaw and Shelton McPherson cut and peeled logs for cabin sills at Castle. In 1916 the lumber stored at Bald Mtn. was packed over and a cabin was built on the rock capped peak. Though crude by later standards, this was the first observatory on the Fish Lake District and it did have windows on all sides so employees dubbed it "The House of Glass". 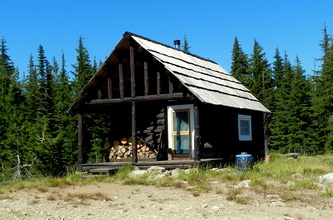 The cabin was in use until 1929 when it was replaced by the more up-to-date L-3 log lookout cabin with a cupola for the firefinder and observer. Harry Chenoweth and Russell Stadtman dismantled the "House of Glass" in 1929 and in its stead built a new L-3 type cabin. The L-3 was designed with a lower room about twelve feet square which was used for living quarters. The fire-finder was housed in a five or six foot square, glass-enclosed observatory that projected through the roof. The lower walls of this cabin were built of logs cut a year earlier; gable ends, roof and cupola were built of lumber covered with shingles or shakes. The cabin was used each summer until 1950 when it was replaced by an L-4 type structure. In August of 1950, Howard Beebe, a carpenter from Weippe, with guard Bill O'Brien and one or two other helpers began work on the new lookout cabin. It was erected on a 7' high understory of the stone that is so abundant on the peak. The cabin was one of the several that had been pre-cut at the Pierce carpenter shop during the previous winter. To make the building more sturdy, all lumber, including catwalk railings, were cut full length. There was no splicing as in some of the earlier pack-in-type cabins. 1931: 20-foot tower with L-4 cab. 1958: 41-foot treated timber tower with R-6 cab. c.1933: 50-foot pole tower with L-4 cab. 1953: 41-foot treated timber tower with an L-4 cab. 1929: log cabin with roof platform. c.1933: 30-foot tower with L-4 cab. 1934: 30-foot pole tower with L-4 cab. c.1933: tower with L-4 cab. 1981: "1915 was the first year that Eagle Mtn. was manned as a regular season lookout. Sometime in July, Sam Weholt and Al Peterson were set up for business in a tent camp near the observation point. At Eagle Mtn. the two men installed a post in the rocks on top of the peak on which they mounted their Koch baseboard and map. Communication with Castle Butte was established sometime in August. The telephone line was number nine galvanized iron wire from Castle Butte to the Lochsa River and emergency wire from there to Eagle. As far as is known, this lookout was manned each season, using tent quarters, until 1920. Since there were no improvements at the point, abandonment consisted of loading the camp on a pack string and pulling out. July 12, 1958: "Two men waiting in the woods with a damaged helicopter will have to spend another day there because the parts needed to repair the craft didn't arrive in Missoula Friday in time to be shipped to them. The helicopter was disabled Wednesday in landing at Elkhorn Point lookout in the Selway-Bitterroot primitive area north of the Salmon River breaks in Idaho. The trip to them will be made Saturday with another helicopter carrying blades for the rear rotor and a rotor shaft along with a mechanic. 1959: R-6 cab atop a 10-foot concrete base. 1922: Established as an observation point with a tent camp. 1939: A ten-foot log tower with a L-4 cab was erected. 1955 or 6: Lookout was condemned and burned. 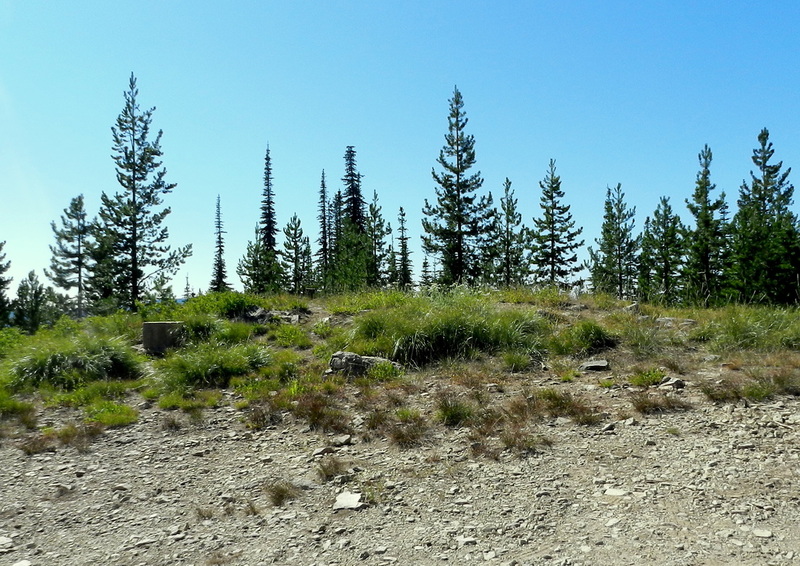 1981: "End Butte was first used as an observation point in 1922 when Fish Lake District Ranger Al Kolmorgan set a tent camp in a little meadow at the head of Wounded Doe Creek about 3/4 mile from the top of the Butte. Scheduled patrols were made to End Butte and out the ridge to Eagle Mtn. Telephone communication with Boulder Creek R.S. via an emergency wire line tied into the emergency line which at that time connected Stanley Butte to the iron wire line at Fish Lake Saddle. c.1930: Two-story log cabin with cupola. 1981: The first seasonal lookout at this point was a cedar bark shelter located about 3/4 mile northwest of the observation point. 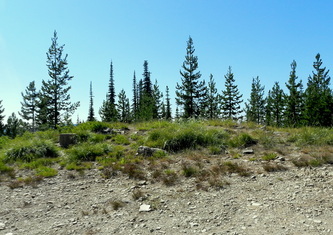 Several years earlier the Butte was used as a patrol lookout and a post was set at the summit for the map-board. In 1919 the lookouts set up their tent camp a short distance below the observation point. In the beginning a heliograph was used as communications with Coolwater Lookout. A telephone line was completed that summer and connected Fish Butte to Kooskia. "In 1921 and '22 a log cabin about 14'x16' in size was built on a little bench about 150' NW from the top of the peak. The log cabin served as lookout quarters until 1930. In 1930 enough of the granite boulders on top of the butte were blasted off to provide a flat place for a cabin. On the flattened area, District carpenter Earnest Hartman and Fish Butte lookout Lloyd McHone erected the 14-foot square, 8-foot-high log base. Atop the base they assembled the 14 x 14 pre-cut, glass enclosed combination observatory and living quarters from material that had been packed to the point by mule train. Construction cost was $471.00. There was no catwalk around the outside to raise shutters and secure the shutter braces, working on a rickety pole stepladder, a man working alone had to be both an acrobat and a daredevil. This cabin was manned through the 1953 season, then dismantled after a new cabin was completed. Logs were saved for wood stove and the remaining debris was burned." In 1953 a steep, narrow road was built from Fish Butte Saddle to the lookout to help facilitate the moving of materials for the new lookout. "Dynamite was used to flatten more of the rock along side the old cabin, on this site the new structure was built. It had a concrete floor and an eight foot high understory of concrete blocks on which the modified L-4 lookout cabin was put together. All the lumber was cut to full length for a sturdier building. Total cost of material and construction was $2531.00. 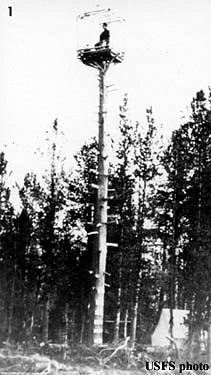 1931: 20-foot pole tower with L-4 cab. 1981: "In 1933 Earnest Hartman and Richard Stadtman built an L-4 cabin on a 50' tower at a cost of $915. The structure was used seasonally until the late 1940's or early 1950's, then dropped from the fire plan. c.1960: The tower was toppled and burned. 1931: A 30-foot round timber tower with a L-4 cab was built. 1954: The tower was cut down and later burned. 1981: "The point was manned for the first time in 1931 and that same year Earnest Hartman and Harry Chenoweth were moved to Gold Hill under the direction of Ranger Fred Shaner and there they built a 30' high log tower on top of which they assembled a pre-cut L-4 lookout cabin. Material for the cabin was packed in from roads end at Bimerick Creek by mule train and as in all cases of offroad tower construction, sand, gravel and cement for the concrete piers on which the four tower legs were to set and anchored, was also moved in by pack string. Sand and gravel were available on the Lochsa River, near the station. When the tower and cabin were completed, the lookout man moved in and, with very few exceptions, the point was manned each season until 1951. 1981: "The butte was first used as a seasonal detection point in 1928 when Ranger Ralph Hand set up a tent camp on the south side of the peak perhaps 1/4 mile from the top. 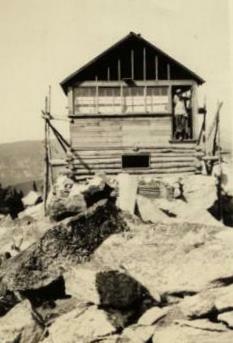 Construction of an L-3 lookout cabin began in 1929. Before the cabin was finished, the Bald Mtn. fire blew up and endangered the lookout. The crew was ordered to evacuate the camp, but before leaving they built a trench around the area and burned out the inside. Everything inside the trench was saved. By 1930, Ranger Fred Shaner had taken over the District. He sent Earnest Hartman and Harry Chenoweth in to finish the cabin that summer. In time, the lookout man added a shake covered woodshed, a root cellar and the usual Chic Sales (outhouse) to complete the complex. 2004: The lookout structure was restored. 1931: 100-foot steel tower erected. 1934: A 30-foot round timber tower with a L-4 cab was erected. August 1934: The lookout was destroyed in the Pete King fire. The site was not used again. 1928: log cabin with cupola. 1917: camp with alidade platform. 1960: R-6 cab atop a 10-foot cinder block first floor. July 26, 2013: The lookout structure was wrapped in a fire retardant material as a precaution to an oncoming wildfire threat. The lookout staff were temporarily moved to Salmon Mountain. 1930: A L-4 cabin was constructed atop six foot high log cribbing. 1961: R-6 cab atop a 10-foot concrete base. 1921: Replaced Big Rock 62. 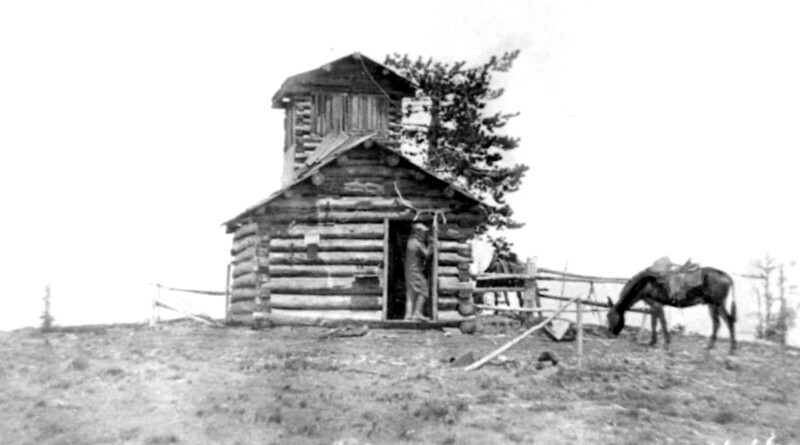 1932: 35-foot platform tower with a two-story log cabin. 1938: 30-foot tower with L-4 cab. 1933: 30-foot tower with L-4 cab. 1932: L-4 cab on a log crib. 1934: The lookout was destroyed in the Pete King fire. 1953: 41-foot treated timber tower with L-4 cab. 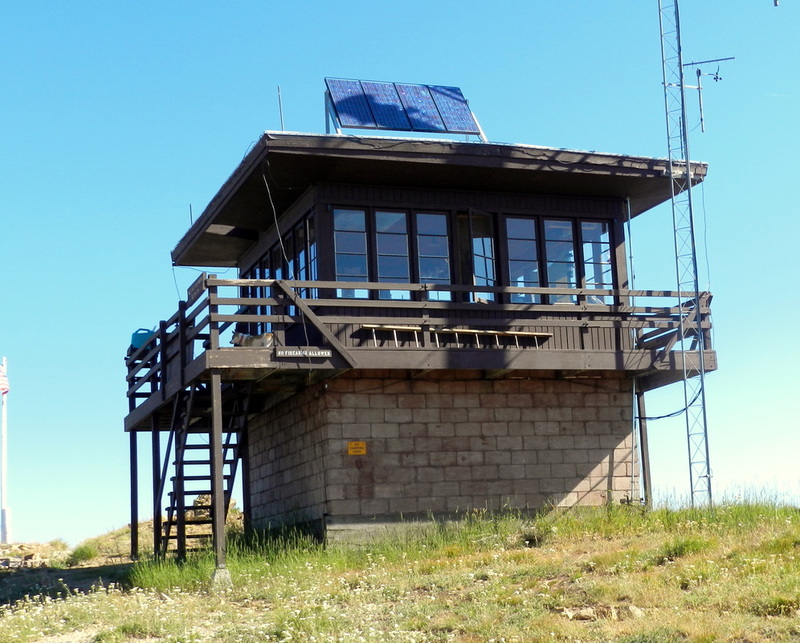 September 13, 1992: "In reference to Sandra Lee's 'Up Front' in the Sept. 2 issue of the Lewiston Morning Tribune, the Jersey Mountain lookout cabin was built in 1934 by Howard Higgins, who later became ranger of the Dixie District on the Nez Perce National Forest. 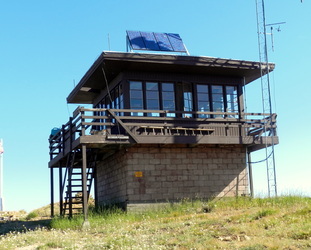 The lookout cabin sat well above the timberline on the rocky knoll of Jersey Mountain. The tower was not constructed until the late 1950s because the trees began to grow up the slope of the mountain making the cabin and its lookout cupola ineffective. My husband, Dr. Fred Brown, was employed by the Dixie Ranger District during the summers of 1942, '46, '47, '48 and '49 on trail and telephone maintenance and as lookout on Jersey Mountain. I joined him there for the summers of 1948 and '49 after we were married. The road was built to the lookout in the spring of 1949. Prior to that time supplies were packed in by pack string and water backpacked a little over a half mile from a spring south of the lookout. 1938: 40-foot pole tower with L-4 cab. 1930: A 65-foot tree crow's-nest was established. 1931: A L-4 cab was erected atop a 8-foot high log crib. 1941: The final year the lookout was staffed. early 1950's: Materials were salvaged and then the structure burned. 1933: 20-foot tower with L-4 cab. 1935: 50-foot tower with L-4 cab. 1955: 53-foot treated timber tower with R-6 cab.